Homes, churches, weddings, and funerals all provide occasion for us to welcome and receive our honored guests. 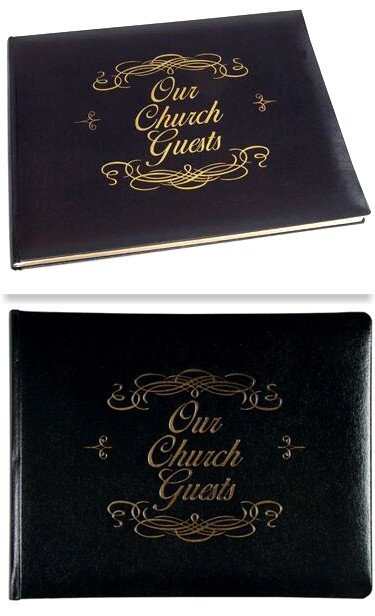 Broadman offers you a black guest book with a bonded leather padded cover, rounded corners, gilded gold page edges, and ribbon marker. This 58-page book lays flat for the easy signing of over 700 names and addresses. All pages have Psalm 122:1 (I was glad when they said unto me, Let us go into the house of the Lord. KJV) on them and are acid free. This 10 5/8" x 8 1/2" book is black with silver lettering on the cover and comes in a gift box.